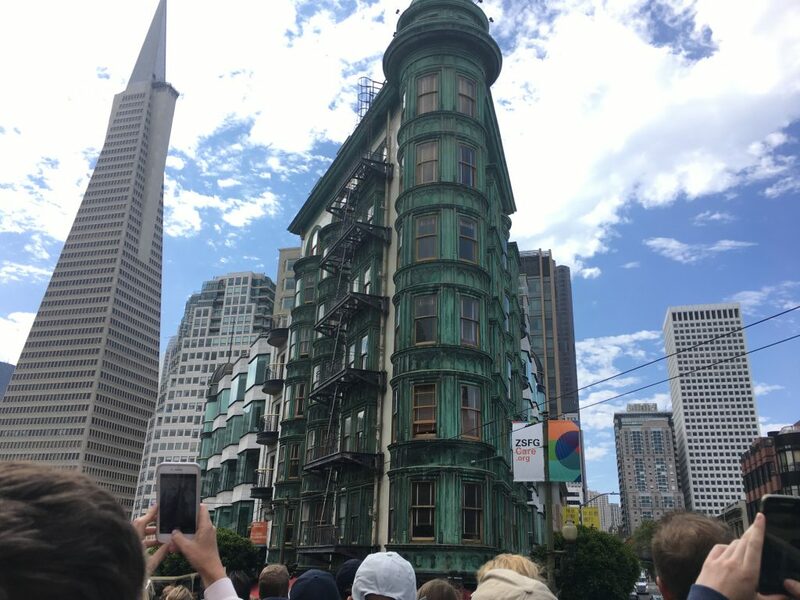 San Francisco is a city we all have once heard of and probably once dreamed of. 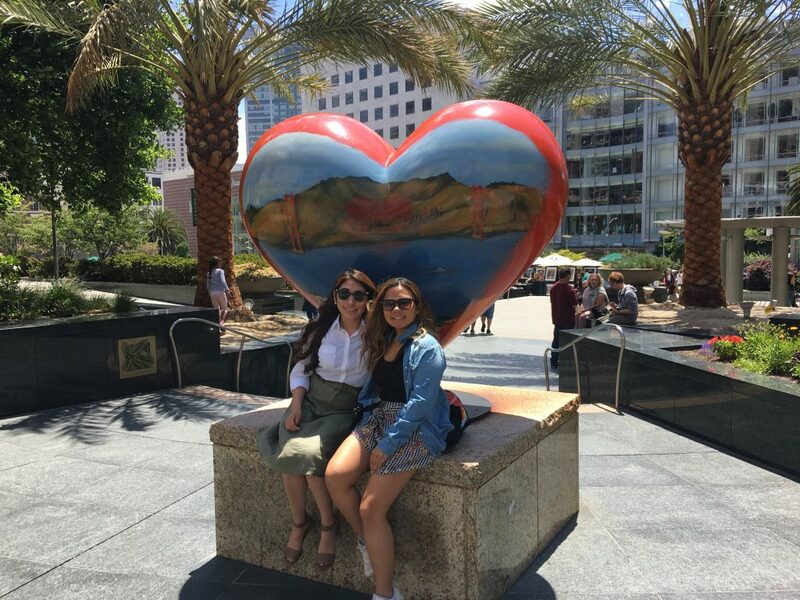 For travel enthusiasts like my friend Leslie Lopez and I, we randomly booked a flight in July out of the blue to explore a city we have always been curious about since we were little, San Francisco or also referred to as The Golden City. From the golden hills encircling through the landscapes of skyscrapers to the iconic vivid red suspension bridge that gained cinematic prominence to the steep streets where cable cars ride through, San Francisco is an internationally-famous dream getaway that sits on a bay that is combined by both salt and fresh water and is neighbored by other major California cities such as Oakland, San Jose, and Fremont. The city is also prone to fog that many locals get used to and it is embedded with a rich history where it developed into a center of maritime trade, a place enchanted by immigrants, fortune-seekers, and artists, and became a business city since the 20th century to present-time with an emphasis on finance and technology where startups and global brands thrive (thus, this is where Silicon Valley is located in). Leslie and I enjoying the sunny weather in San Fran! 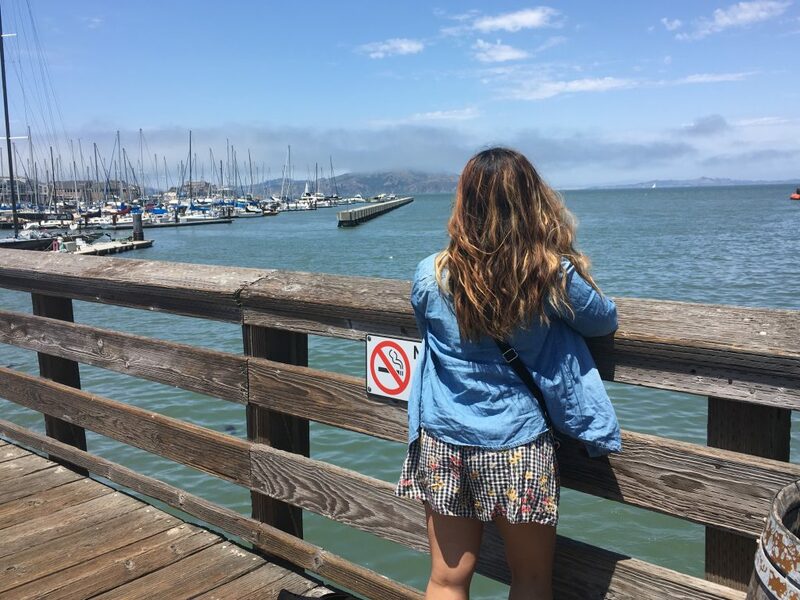 If you are planning to visit San Francisco for your first time in the future, Leslie and I gathered a list of prominent places we recommend you should visit. These places can be visited in just 4 days (just the amount of time we had when we visited). A San Francisco trip would not be complete without seeing the highly photographed Golden Gate Bridge once, but it’s even more enchanting when you see an up close view of it. Although the suspension bridge is actually painted an orange vermilion color, it appears red to many and it was chosen to be colored like that for the visibility against the fog. 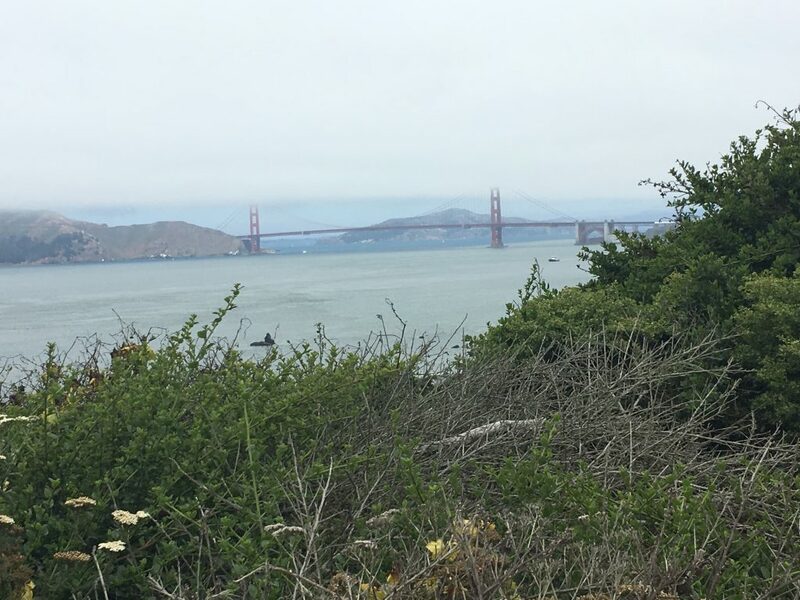 You can view the 220 ft. Golden Gate Bridge from many different angles especially as you cross to the ends of the bridge and the best place to get around doing that is through the Golden Gate National Recreation Area (GGNRA), managed by the National Park Service. According to National Park Service’s site, this rich and diversified park has 19 distinct ecosystems with about 2,000 plant and animal species. Through the park, you can see breathtaking vistas, go hiking in their trails, and do picnics. 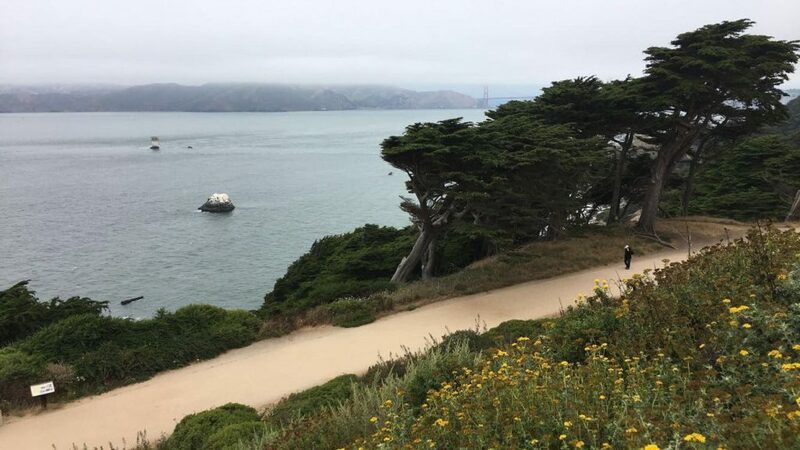 When we went, we visited Marin Headlands, Lands End Trail, and Baker Beach, which are all part of GGNRA. Baker Beach was an exceptional beach to visit with a nice visible view of the bridge, has a delightful section of flora, and a scenic view of colorful homes on the hills. 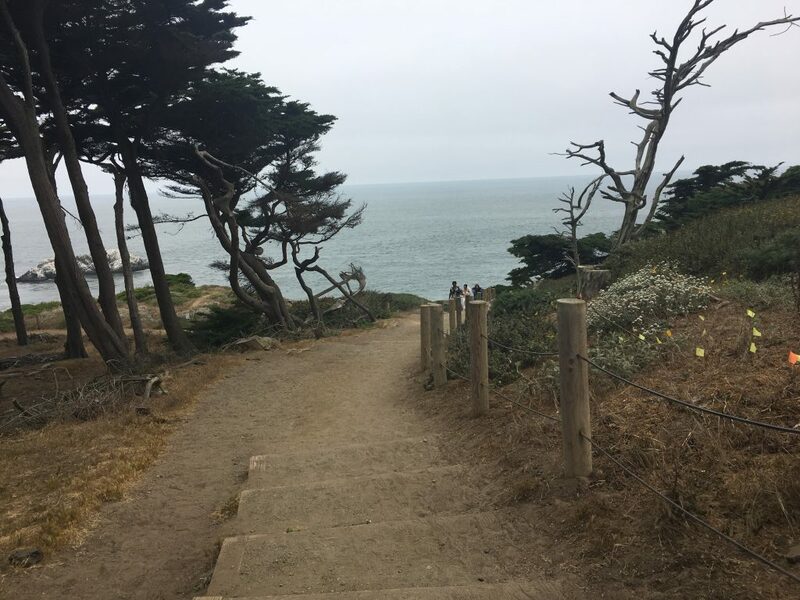 Part of the Golden Gate National Recreation Area, this beautiful and not too long of a hike will take you to many angles of the Golden Gate Bridge and display a spectacular coastal terrain. 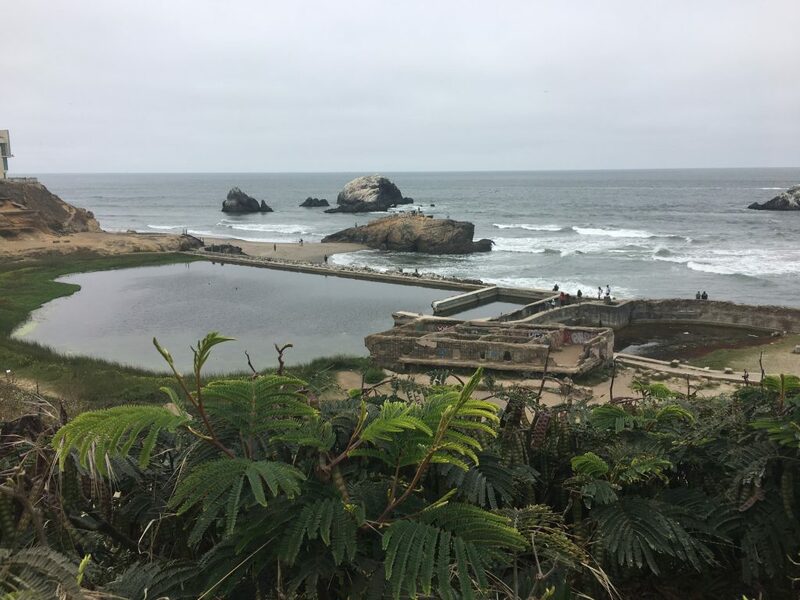 Taking this trail with awesome foliage around will lead you out to Sutro Baths, a 19th century public saltwater pool that is now privately owned where its facility burned down in 1966. 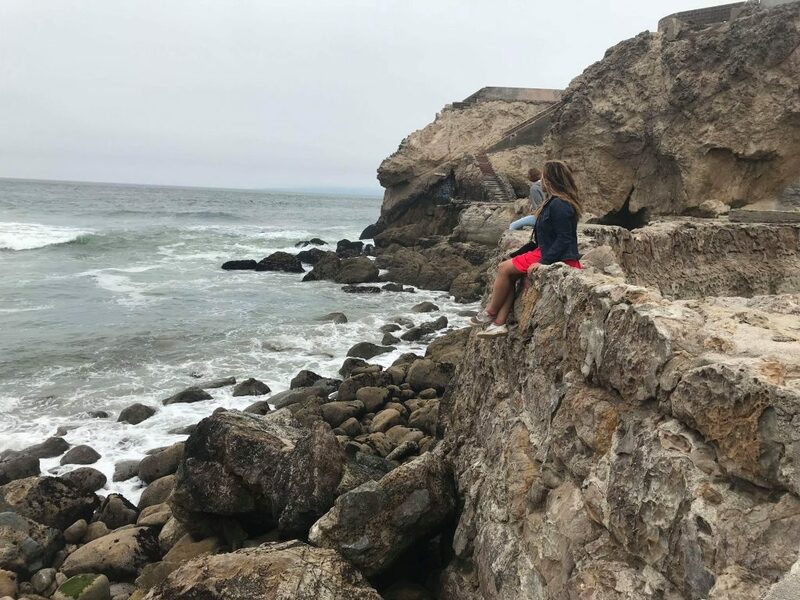 When you head more down from Sutro Baths, you can enjoy the beach and climb the beach’s rocks that tourists seemed to love to do. We loved it, but keep in mind, don’t wear white shoes to the trail. As if getting my white shoes soaked by the water on Baker Beach wasn’t enough to turn my white shoes into black shoes, sand just couldn’t keep away from the shoes. Most tourists opt for bus tours in cities new to them. 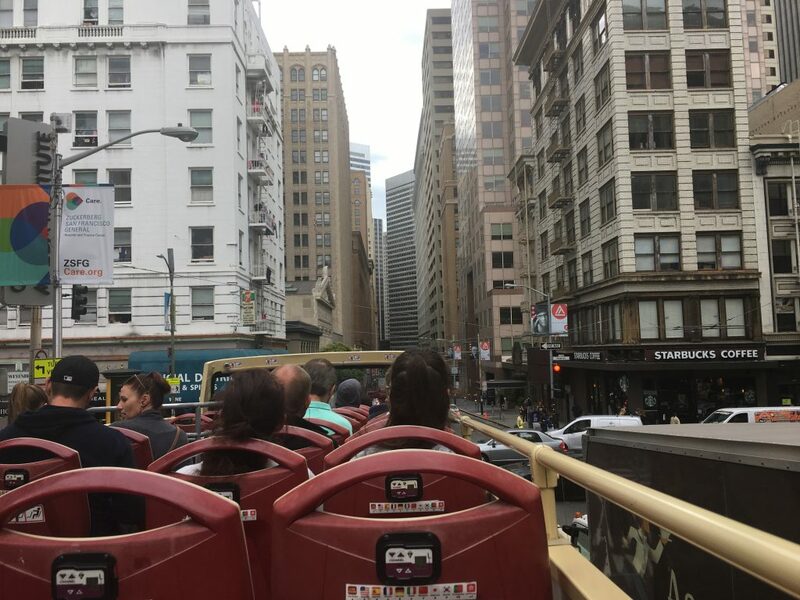 Haven’t done this before, hop-on and hop-off bus tours are a fantastic way to view many parts of a city without the need to locate where the good destinations are and you also get to hear audio explanations and history of the places you are viewing from the tour. The bus tour company that we took and that we recommend is BigBus. Their affordable bus tour tickets will all allow you to walk off and tour their stops on your own. 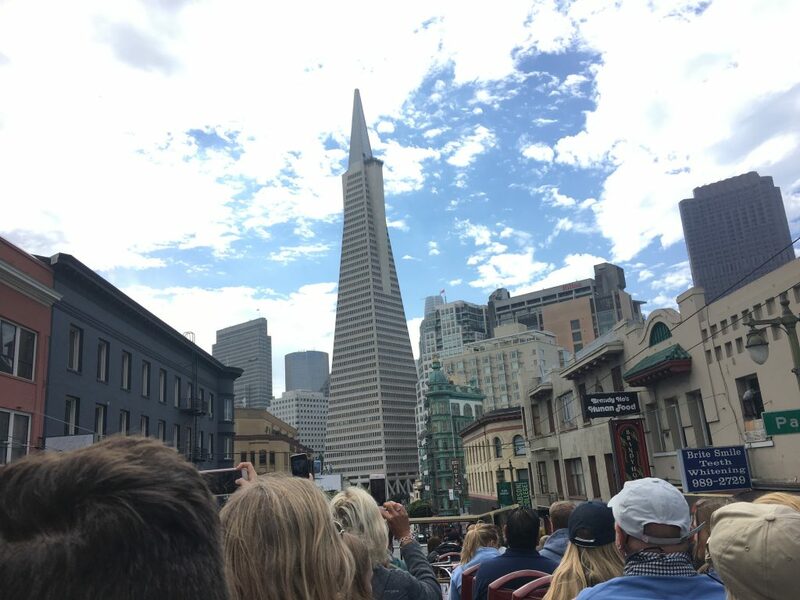 The bus tour is so worth it that most of the iconic well talked-about sights we listed here were explored from taking BigBus. It takes you through the busy city parts like the financial district (the architecture of the skyscrapers here are amazing!) and Chinatown to Haight Asbury to the surroundings of Golden Gate Bridge. 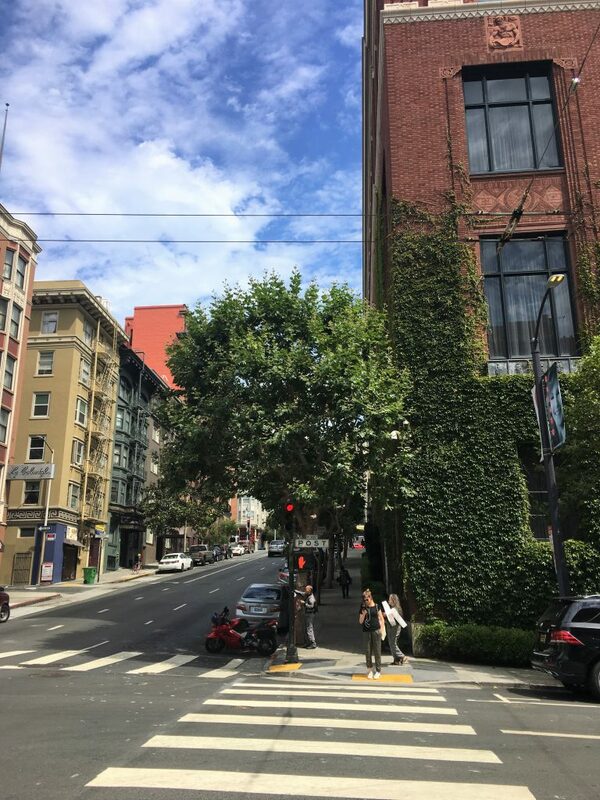 In the neighborhood of Nobb Hill, which served as a center for San Fran’s upper class, view the luxurious hotels and historic mansions. 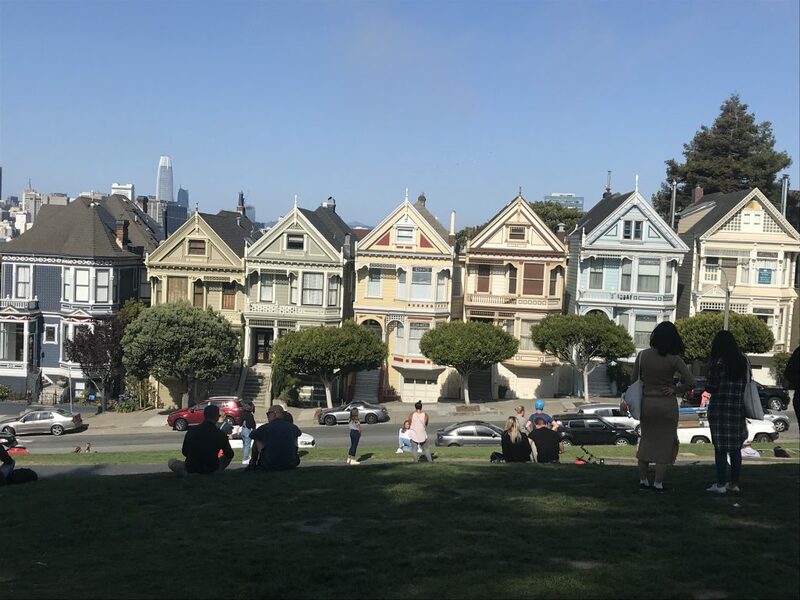 In Haight Asbury or while sitting on the soft grassy hill areas of Alamo Square Park, be sure to get a peak of the famous Painted Ladies, a row of Victorian and Edwardian houses from the 1960s that were repainted with a multitude of colors to enhance the architecture. If you want to see a one-block section street or “the most crooked street in the world”, check out Lombard Street. 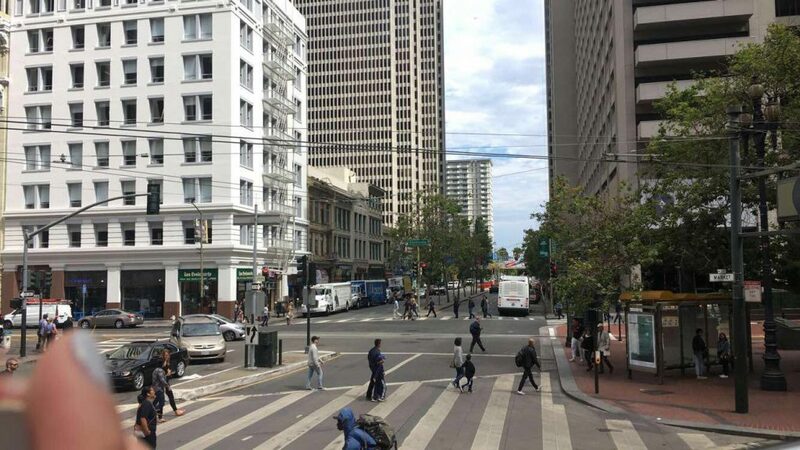 Visit the roadway of Embarcadero; it serves as the home to many waterfront attractions such as The Ferry Building to several piers and Pier 39 (we will talk about this in a little later). Want to see a botanical garden park and museums? BigBus got you covered. 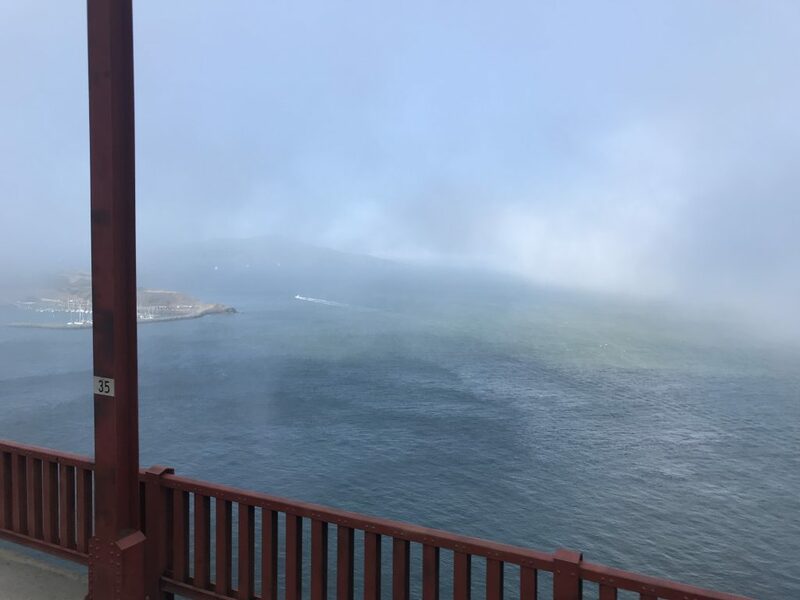 The hop-on and hop-off bus experience was made more fun for us while passing through the Golden Gate Bridge as we had to hold tight and still while being blown away and slapped on the faces by the heavy and cold winds from sitting atop on the uncovered rooftop of the tour bus. I had a joy eating some of Leslie’s hair. 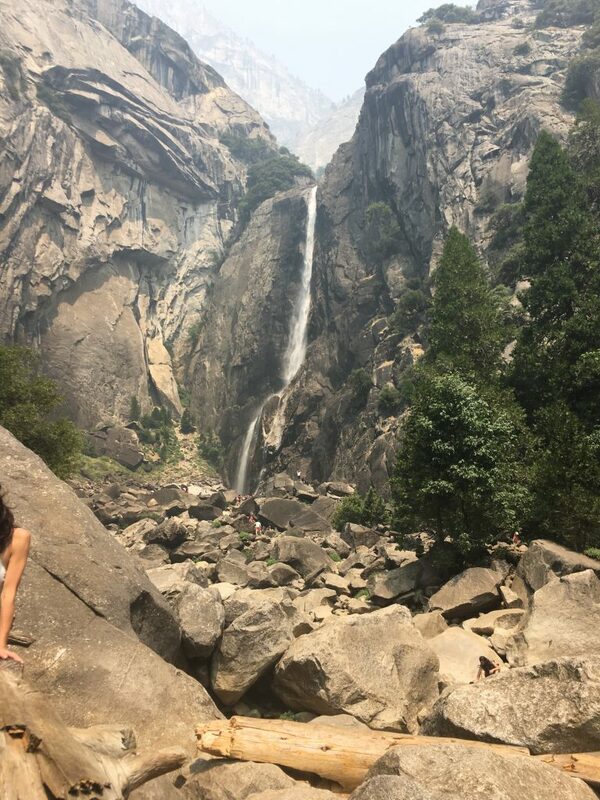 Although outside of San Francisco, we had the pleasure to be able to explore the third-oldest national park in the United States, Yosemite National Park. However, getting there at the time was a challenge. Leslie and I had to take a bus from San Francisco to Fresno then a train and then take a shuttle bus 2 hours away to Yosemite National Park. 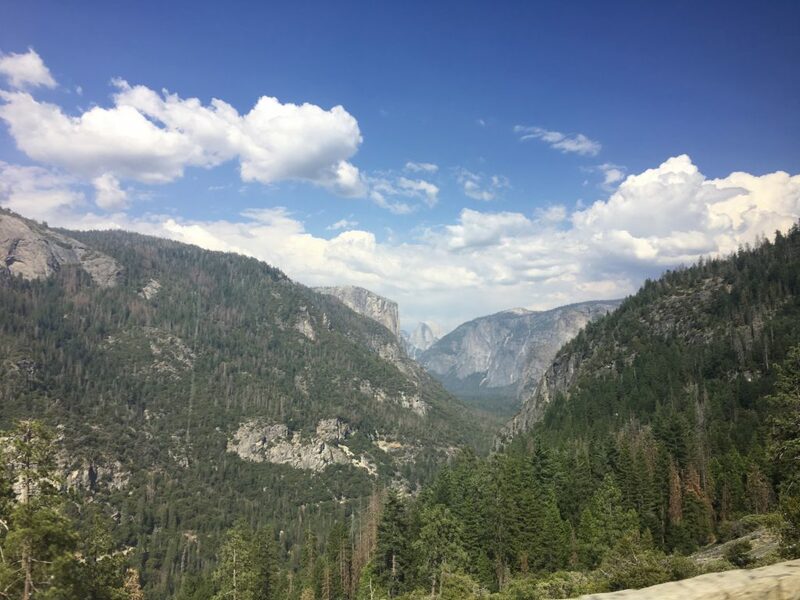 Going to this national park is doable by a bus and not too pricey (we spent about $74+ round trip on the bus ride – but we got reimbursed for the trip back since we decided to rent a car to get back to San Francisco). However, the bus ride to Yosemite National Park put us in traffic for 3 HOURS! We found out about and witnessed the devastating Ferguson Wildfire occurring at the time. Due to the limited time that we had and having original plans to go home the same day, we had no choice but to book a (ski resort) lodge last minute so that way we can explore Yosemite the following day and at the time, it was the cheaper option to stay in (I bet it looks even prettier in the winter time!). 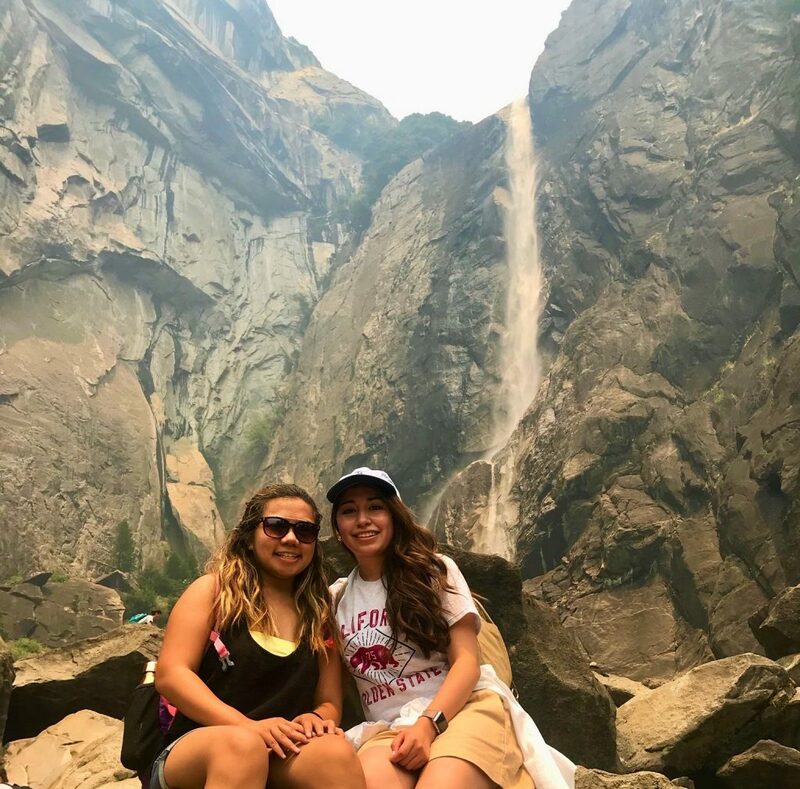 When we returned the following day, the day was still clear and we were still able to hike the Lower Yosemite Falls to see the 320-ft falls coming down from North America’s tallest waterfall (it drops at 2,425 ft), which rewards you with spectacular views from the Upper and Lower Falls. The air condition around the park got worst as the hours passed and it became a smoky atmosphere that spread throughout, where you can smell the smoke as if there was a lot of people grilling for a barbecue. We saw blue skies turn to yellow skies in a short amount of time, lowering the visibility of El Capitan, a 7,569 ft vertical rock formation that will capture your eyes once you step foot into Yosemite, and a lot of prominent landmarks. When we passed by where the wildfire occurred, we saw black and burnt trees in an area later that day. Yosemite National Park is a must-see place before you die. I can’t describe just how majestic it truly is when you’re actually in the park, and although half of the trip there was disastrous, it was one of the highlights of Leslie and I’s San Francisco trip. 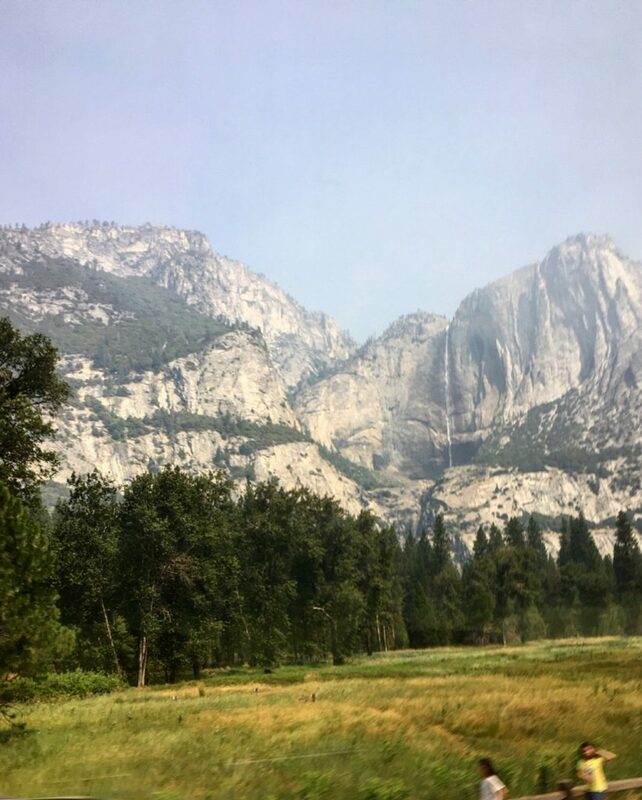 Through our bus views, we were able to witness the grand scenery of Yosemite such as Yosemite Valley. 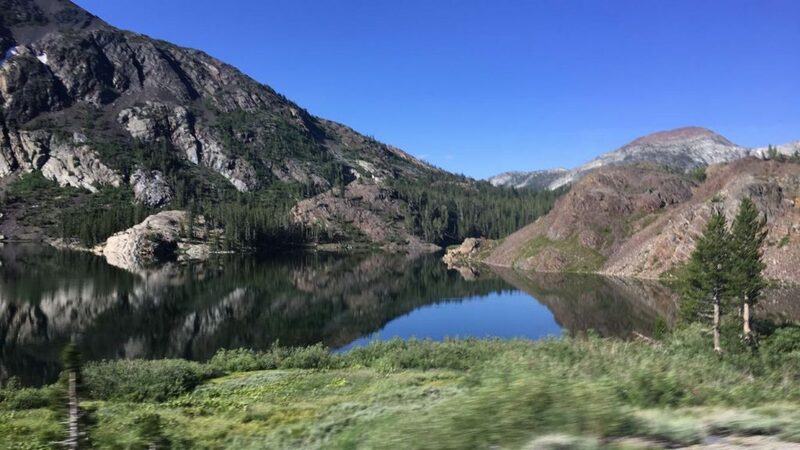 To get to our lodge from there, we also saw scenic mountainous and large glacial lake views from Mammoth Lakes (another place we recommend from San Francisco). 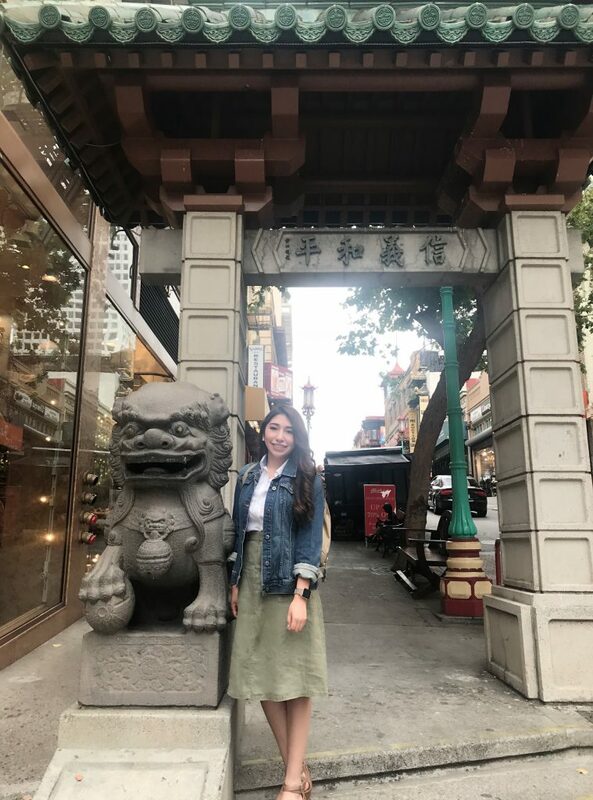 Located at the heart of San Francisco, it is the oldest and largest Chinatown in North America. The discovery of gold in 1849, contributed to its origin and size as many flocked to this port city, including Chinese settlers. 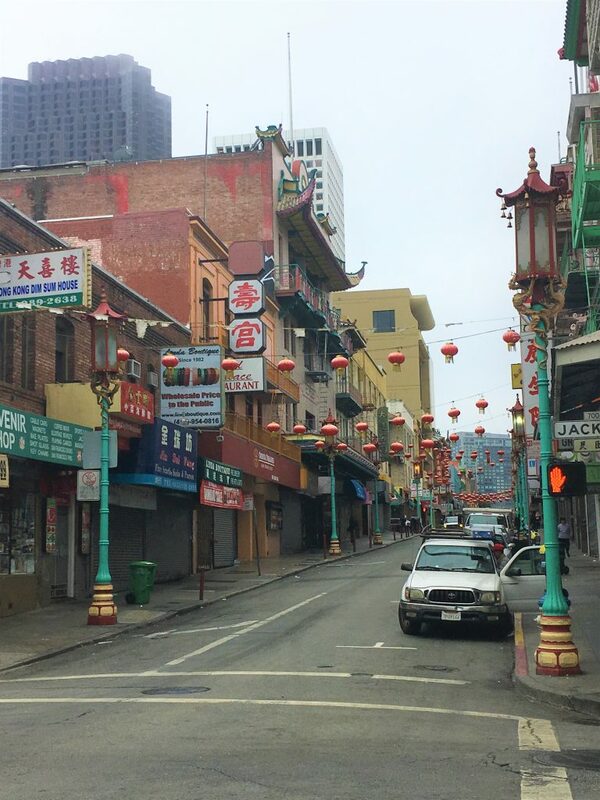 Today, Chinatown spans 24 city blocks and is easily one of the most popular sights in San Francisco. 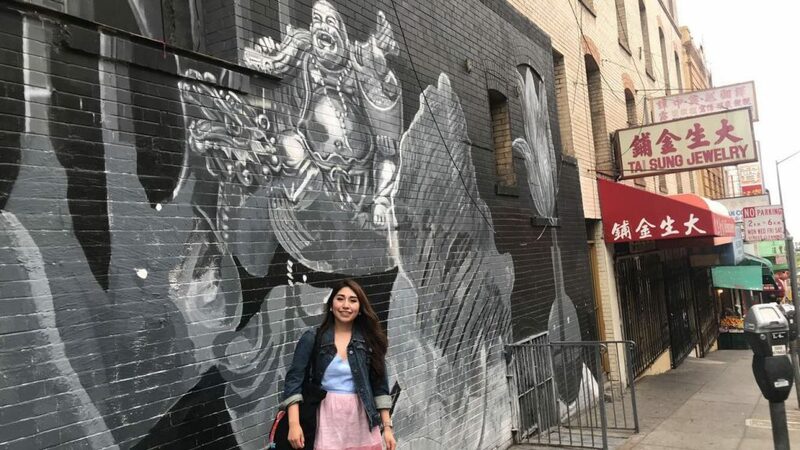 From one first-timer to another, be sure to wear a comfortable pair of shoes and some stretchy clothes, because Chinatown has lots to see and taste. Grant Avenue is a great starting point for any visit. Often seen as the neighborhood’s main entrance, the street is spotted with bakeries, shops, and is home to Dragon’s Gate. As you venture further from the gate, you will start to realize just how large the neighborhood really is. Chinatown’s history, colorful grocers, street art, and gilded displays give it a uniqueness all its own. In truth, I believe an unplanned day of wandering would be just as successful as a planned day. 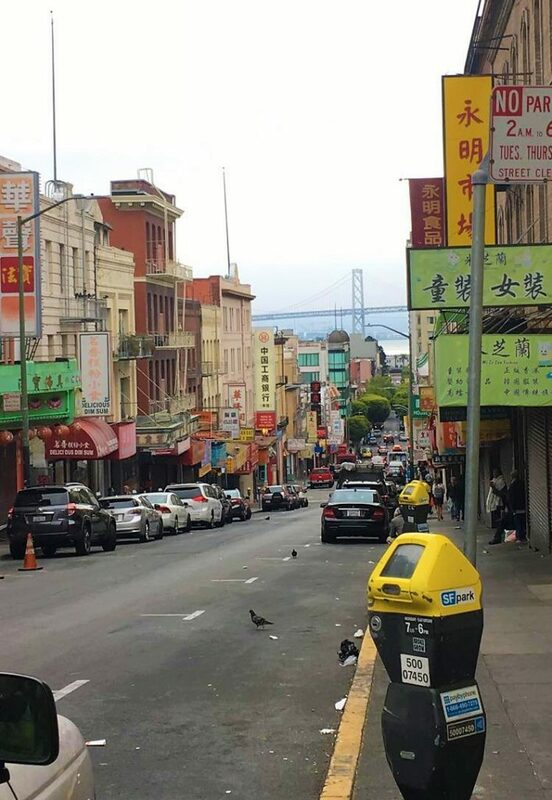 Nonetheless, here are some popular spots: Golden Gate Fortune Cookie Factory, Chinese Culture Center, and Li Po Cocktail Lounge (one of Anthony Bourdain’s favorites ). Also, don’t forget to pick up some Chinese pastries. Gabby and I refueled at the AA Bakery & Cafe for melon cake and pork buns. You can be sure, I now frequent Chinese bakeries in the East Coast’s NYC Chinatown. 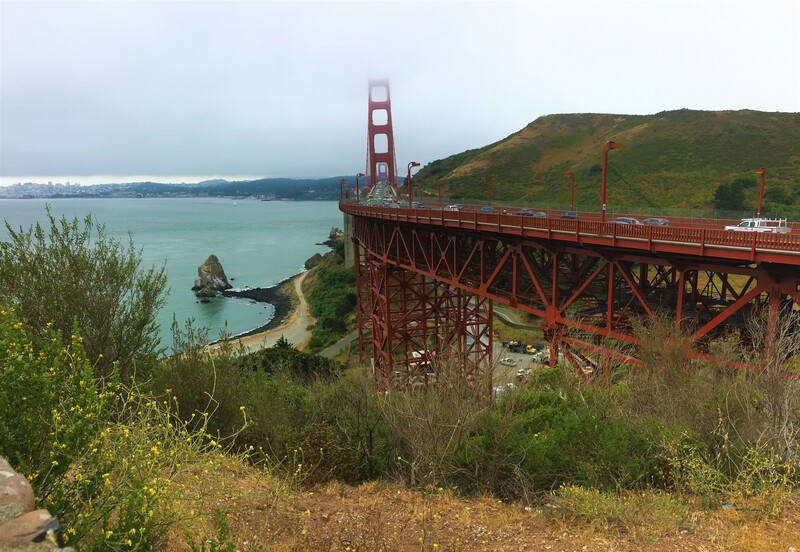 No trip to San Francisco would not be complete without an iconic picture of the Golden Gate Bridge. 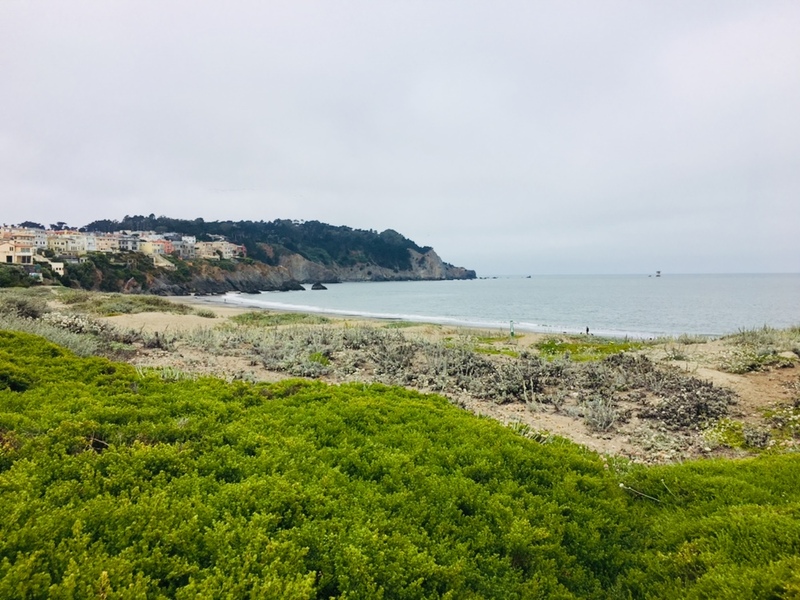 The Marin Headlands presents a perfect vantage point, being located across the Golden Gate Bridge, but the peninsula is also a wonder in its own right. 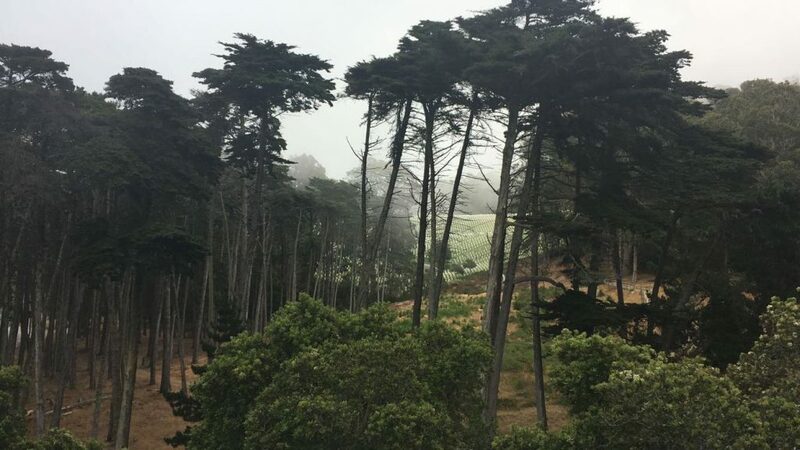 A short drive from the bustling city, the Marin Headlands is wilderness abound. It is home to the Rodeo Lagoon, Gerbode Valley, Hawk Hill, Tennessee Valley, and Point Bonita Lighthouse. For summer visitors and unknowing east coasters (like myself), be forewarned it can get breezy sometimes turning gusty due to the ocean air and fog. So-yes, you should bring the coat. 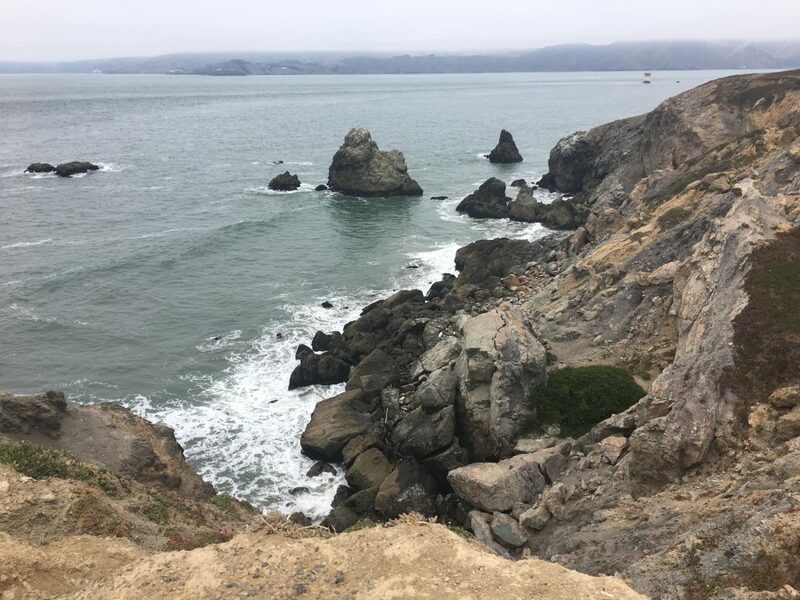 Sweeping vistas, trails, wildlife, beaches, and cultural sights, the Marin Headlands can offer a full day of adventures. 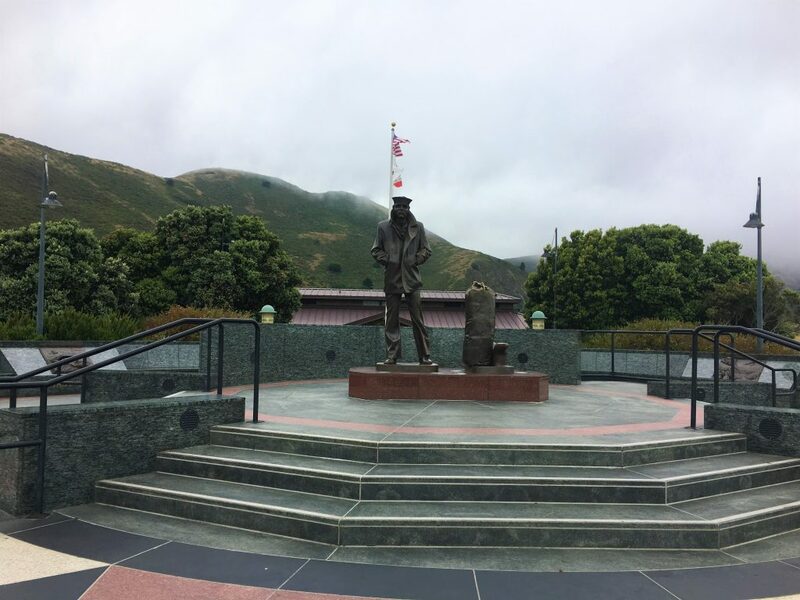 For mesmerizing views visit Hawk Hill or Battery Spencer. 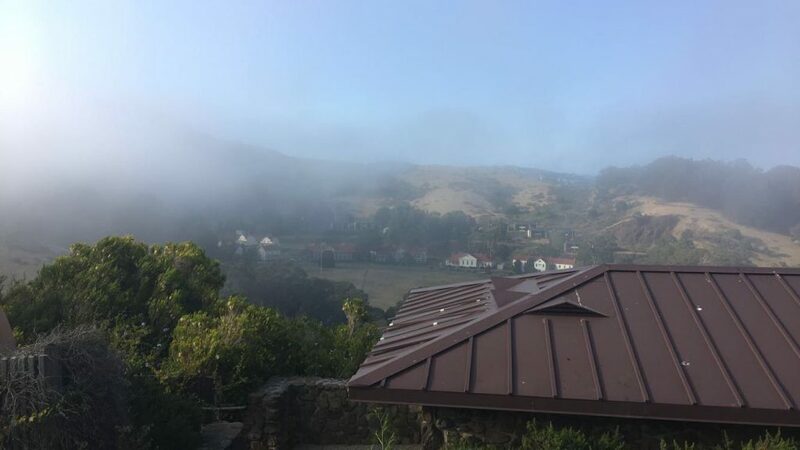 Hawk Hill is known for its 360 degree views of the Bay area and is a hotspot for viewing birds of prey. However, the views from Battery Spencer are fantastic and easily rank among the best. 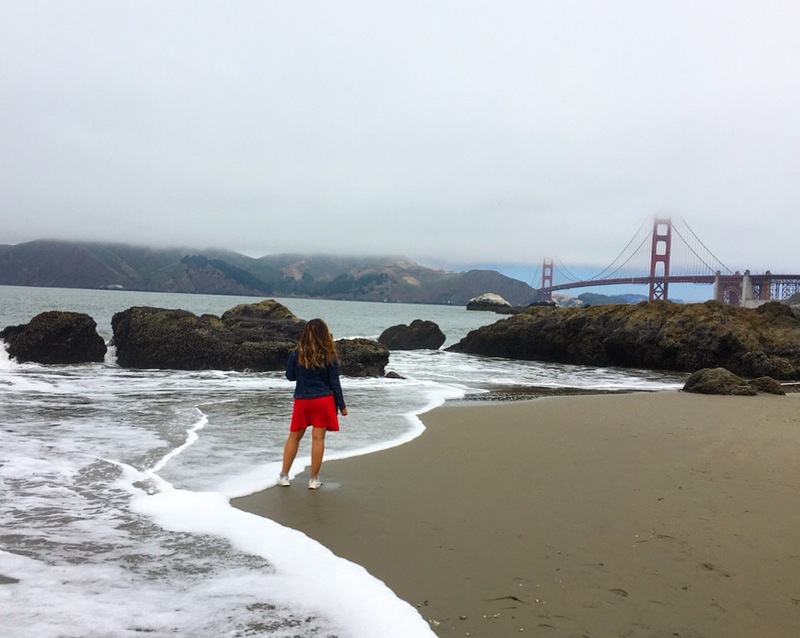 For those not able to leave the city, Baker Beach is a great compromise. A mile in length, the beach is a definitely great escape without a huge commute. 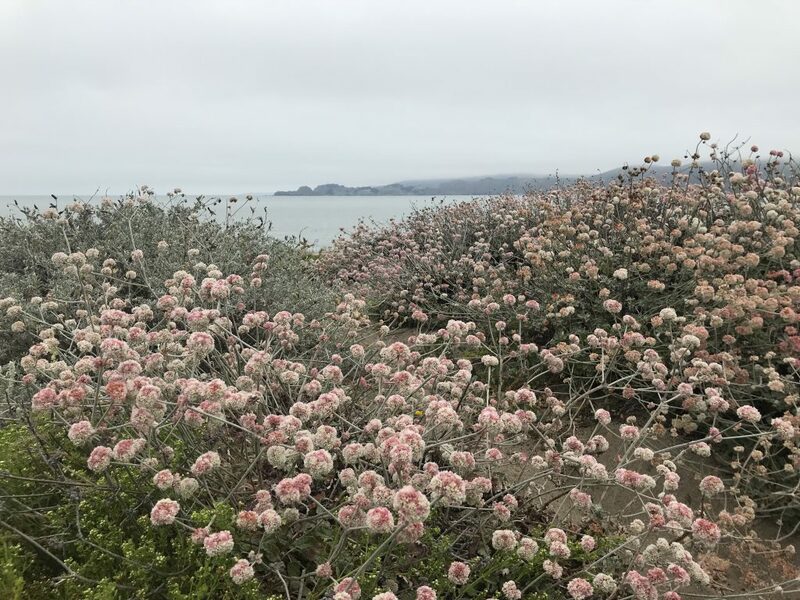 Colorful walkways of wildflowers lead to a sandy shoreline. 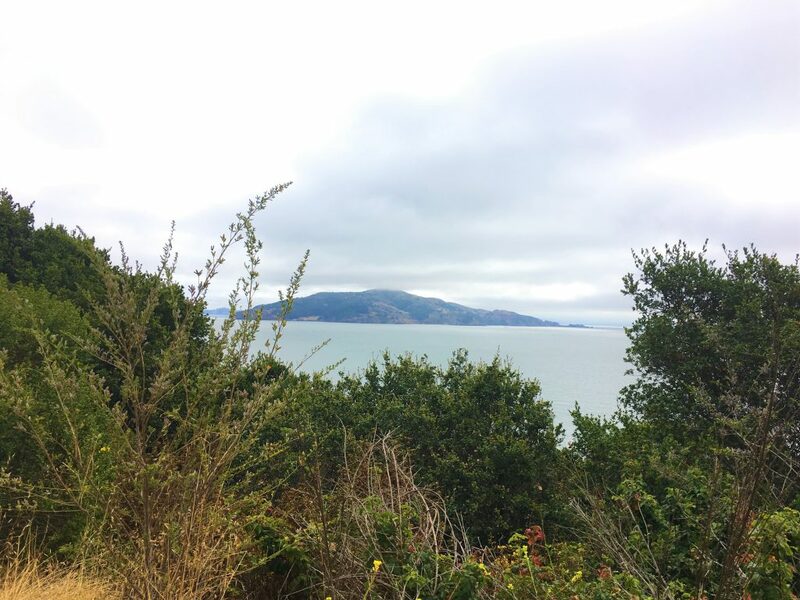 From the shore you can see beautiful views of the Golden Gate Bridge and the Marin Headlands. It is a great spot to picnic, grill, or hike with the Costal Trail nearby. 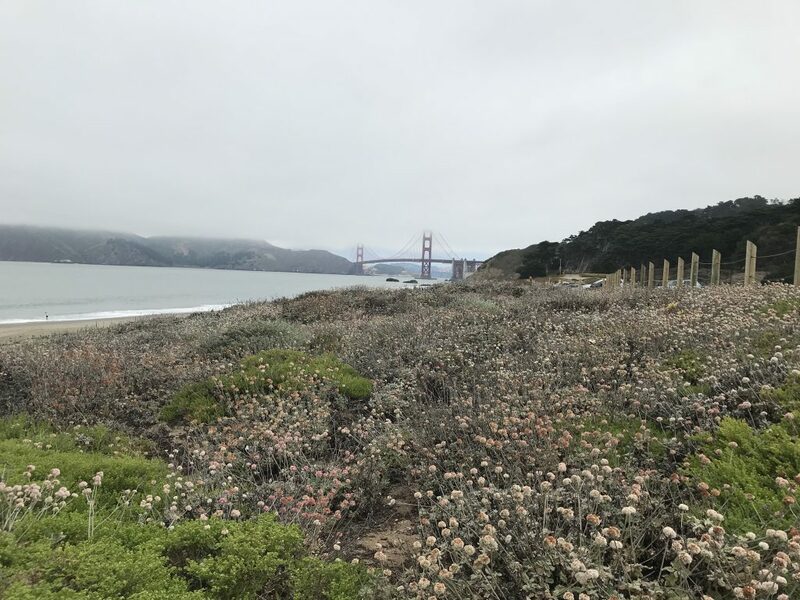 For those visiting in the warmer months, be aware the closer you walk toward the bridge (northernmost end of Baker Beach) it can be frequented by clothing-optional sunbathers. Funny enough, it was particularly cold when we visited, so we left the beach without ever knowing this. Also, the beach is not ideal for swimming given the waves and rip currents, but you really cannot beat the views even on a foggy day. 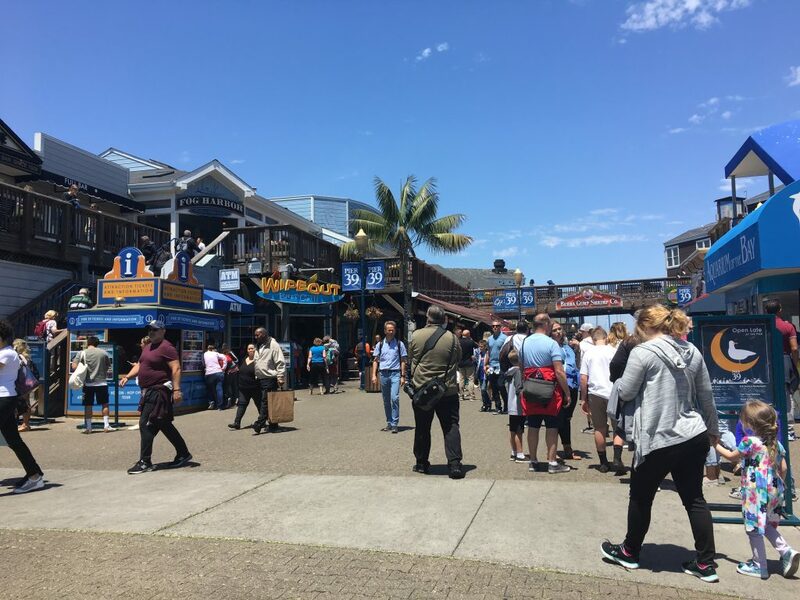 Fisherman’s Wharf is San Francisco’s most famous waterfront community and a great place to get your fill of Alcatraz, street performances, seafood, sea lions, sourdough, and souvenirs. A bustling tourist destination, you can expect crowds and at times the atmosphere can remind you bit of New York City’s Times Square. 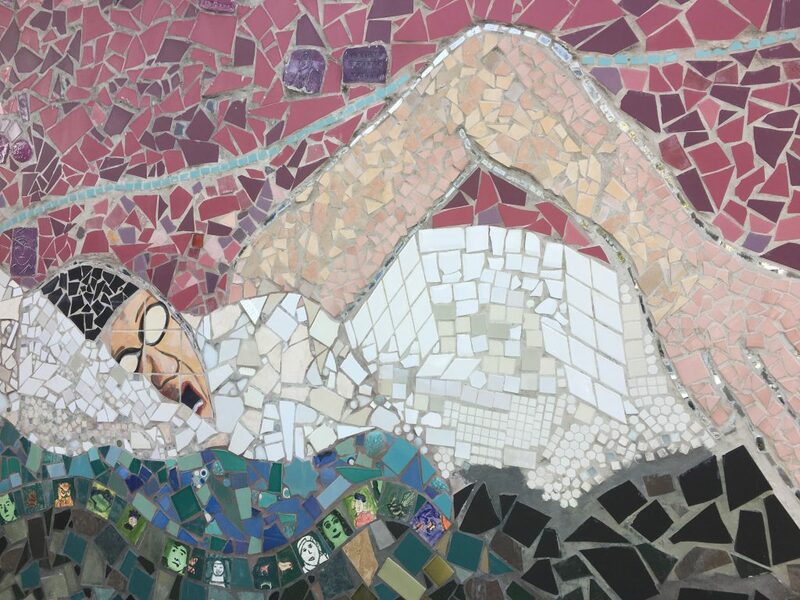 However, it’s the enthusiasm of San Franciscans to welcome travelers that contributes to the authenticity of Fisherman’s Wharf. 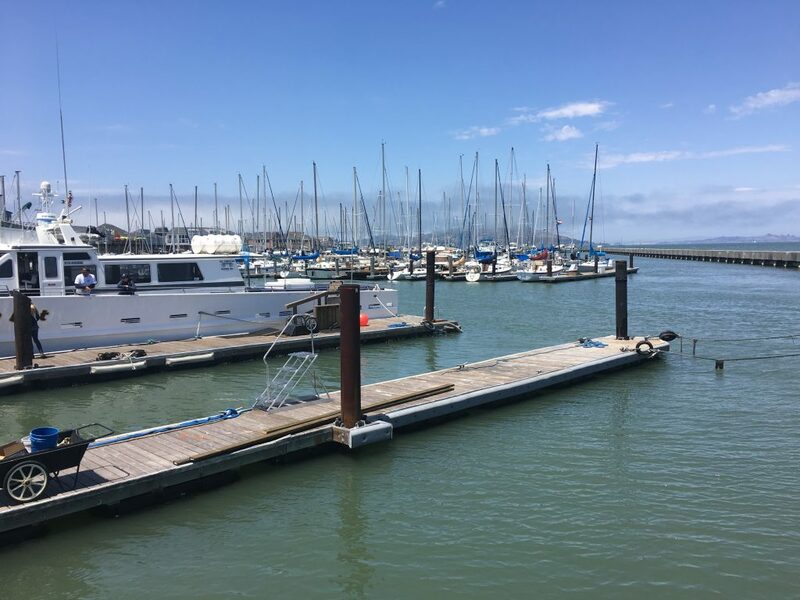 The Fisherman’s Wharf is pretty large covering most of the northern waterfront of San Francisco, but some popular posts are Pier 33, Pier 43, Pier 45, and Pier 39. 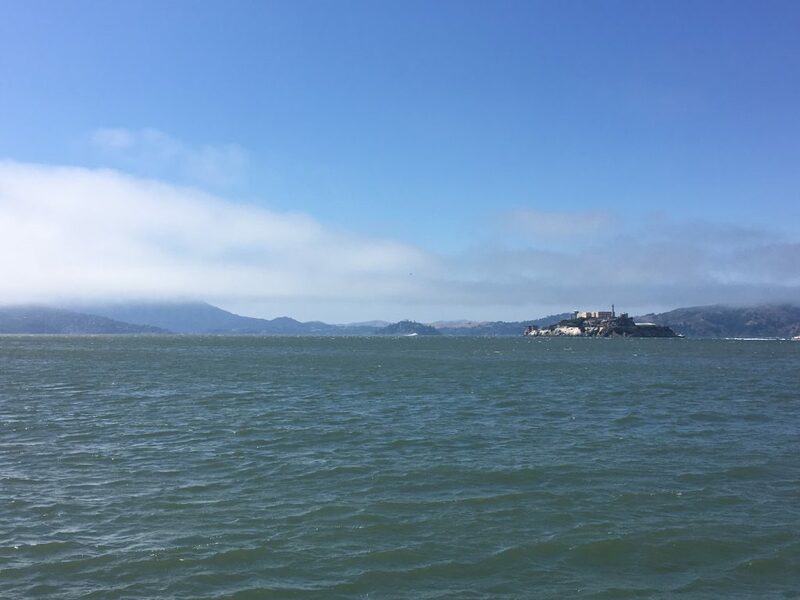 At Pier 33, you can buy a ticket and catch a ferry to the infamous Alcatraz. If you can, try to purchase your tickets well in advance! Gabby and I were disappointed to find out tickets would not be available until a good two months after our departure date. If you are not able to visit Alcatraz, check out the Pier 43 Ferry Arch where you can still capture a full picture of Alcatraz. Pier 43 also has great places to eat, such as Frankie’s Pier 43, which is famous for its seafood. For history buffs, the historic Pier 45 is your best bet. The pier features a series of historic attractions such as SS Jeremiah O’Brien liberty ship. If you have time, visit the Musée Mécanique, one of the world’s largest privately owned collections of mechanical instruments, antique and modern arcade machines, and music boxes. Best of all, this attraction is free to residents and guests. Lastly, Pier 39 is epicenter of action at the Fisherman’s Wharf. Street performances and musicians lead you to a boardwalk market place bustling with people, boutiques, thrilling attractions, savory aromas, laughter, and colorful banners. You can play a tune on the piers’ musical stairs, learn about sea-life at the Aquarium of the Bay, or visit the California sea lions at the Sea Lion Center. There is also carousel, bungee trampoline, and mirror maze if you’re up for some fun. 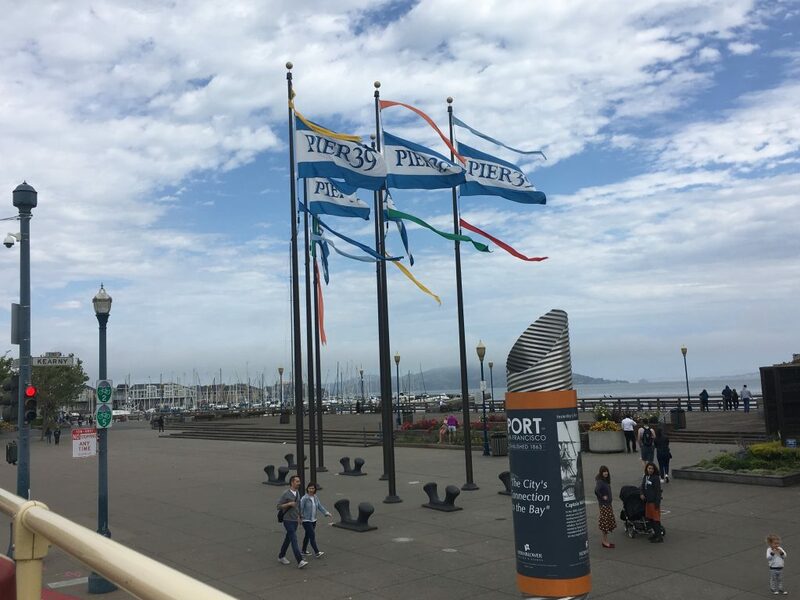 If you are a shopaholic, be warned, Pier 39 is also a great spot to pick up all the San Francisco themed souvenirs you need. The pier is dotted with boutiques and shops that you can purchase “I heart SF” t-shirts, key chains, refrigerator magnets, caps, sweaters, and even canned San Franciscan fog (supposedly, but I wouldn’t recommend opening the can to check). For you left handed folk, take a gander inside of Lefties. A store selling what I, at first, believed to be ordinary, everyday, household knickknacks: scissors, pencils, notebooks. Mind you, I am right handed, but I was soon schooled in the daily struggles of the left handed person by Gabby. After coming to terms with, “It’s a left handed thing…” I soon saw the store with the same sympathy and amazement as the crowds rejoicing over a left hand can opener. Sometimes accidents can lead to very fortunate encounters. 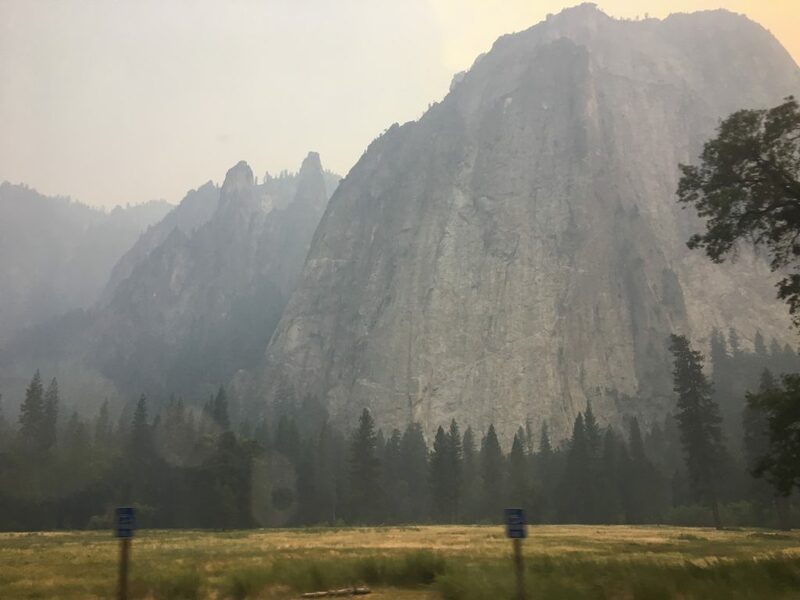 For us, an unfortunate forest fire in Merced, California changed our one-day Amtrak trip into an overnight 13-hour trip between San Francisco, Fresno, Yosemite National Park, and Mammoth Lakes by train, bus, and eventually rental car. However, the trip allowed us to witness some of the most unbelievable vistas I could even imagine, among my favorites places is Mammoth Lakes. For any gamers out there, the vistas were comparable to the Final Fantasy XV, Skyrim, or Red Dead Redemption environments. Located in Mono County, California, Mammoth Lakes is a year-round adventureland surrounded by the Sierra Nevada Mountains. It is about 45 minutes outside of Yosemite National Park and five hours from San Francisco (7 hours in the winter). There is so much charm to Mammoth Lakes from the hiking, sightseeing, to the people. Memorable moments include a visit to a rest stop where I bonded with fellow football fans crowding the TV casting the world cup and the friendly “hello” by locals every morning. Here are some places you should visit: US Highway 395, Tioga Pass, Mammoth Lakes Basin, and Mono Lake. Take a drive on US Highway 395, I promise you will not regret it. In all seriousness, it’s a great road trip along the Sierra Nevada mountain range with views of the 14,000 foot mountains and open valley. 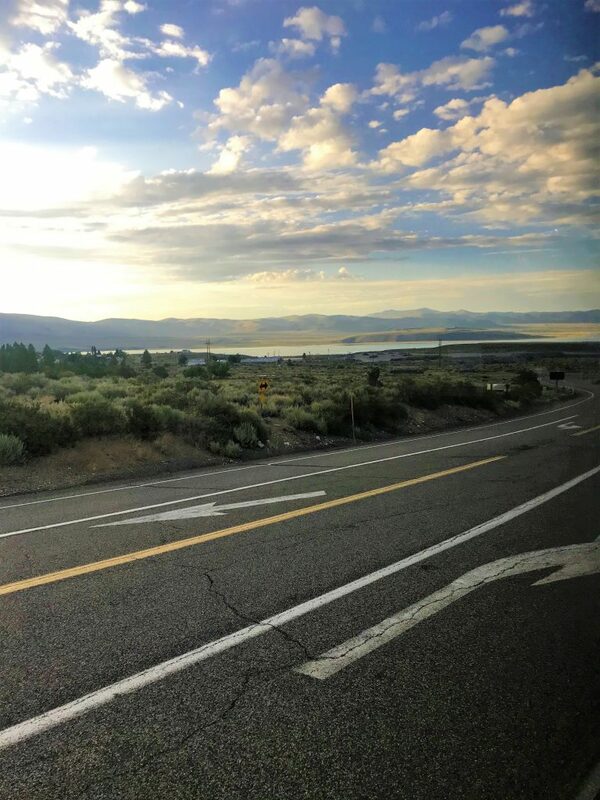 US 395 is the state-designated Scenic Byway surrounded by snow capped mountains, bright blue skies, puffy clouds, pine trees, rocks, and yellow plains. I’m aware I sound like I’m describing an overzealous childhood drawing, but honestly that’s how it felt to visit. For some added validity to my enthusiasm, the highway even ranked in the Travel Channel’s top 20 most popular road trip routes in the United States. 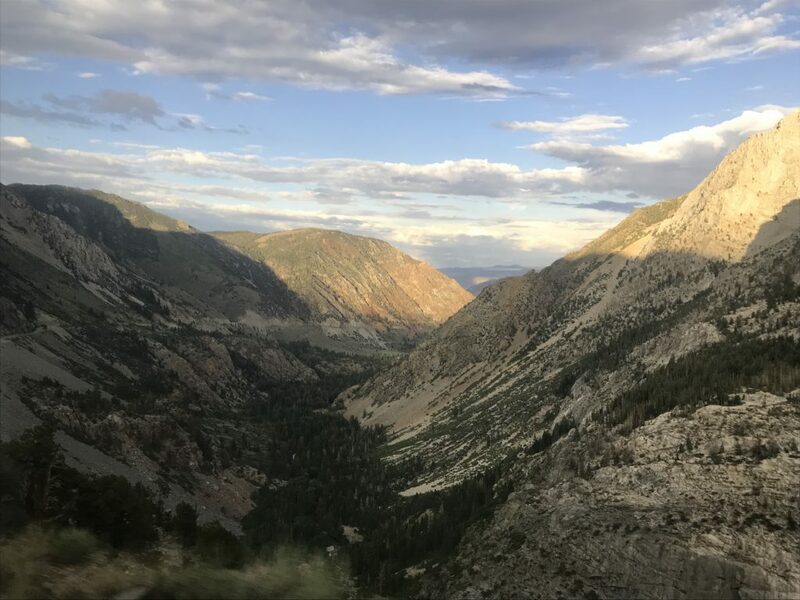 If you are visiting in the summer and driving to Yosemite from the East, Tioga Pass is a little known secret you do not want to miss. Found along Route 120, it is the only entrance gate from the eastern Sierra that takes you nearly 10,000 feet in elevation. As cliche as it may sound, the views are absolutely breathtaking truly close to unreal, but the road is winded, steep, and sometimes borderless, so please drive carefully. Do not get distracted or drive in a hurry, instead pull over at the many open spots for cars to park. Also, be aware that Tioga Pass is usually not from October to May due to snow so please check the National Park service website to plan your routes. 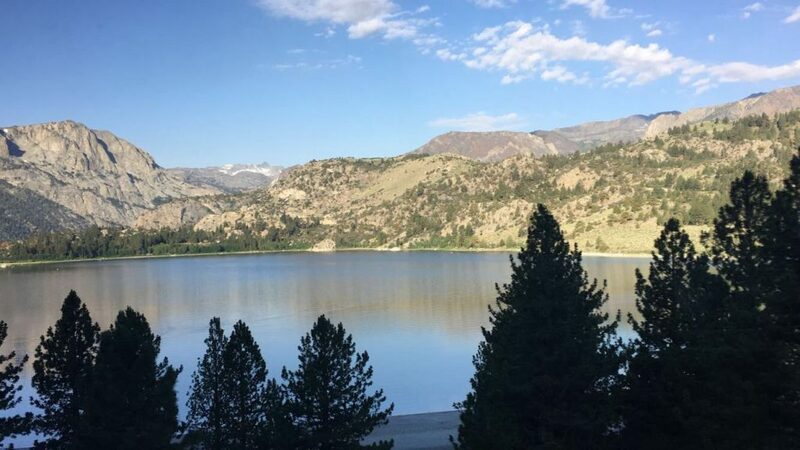 For those looking to hike and explore, Mammoth Lake Basin is ideal with over a dozen lakes, five campgrounds, and over 50 miles of hiking trails. Whether you hike, camp, rock climb, or kayak, there is something for everyone. Another quick stop is Mono Lake, which you can drive to or get to by foot using the South Tufa trail. Popular among photographers and geologists, the lake is famous for its Tufa Towers, which are otherworldly mineral formations that tower above the lake. Mammoth Lakes was an accidental yet very fortunate encounter. I do not think I could not rave enough about Mammoth Lakes. 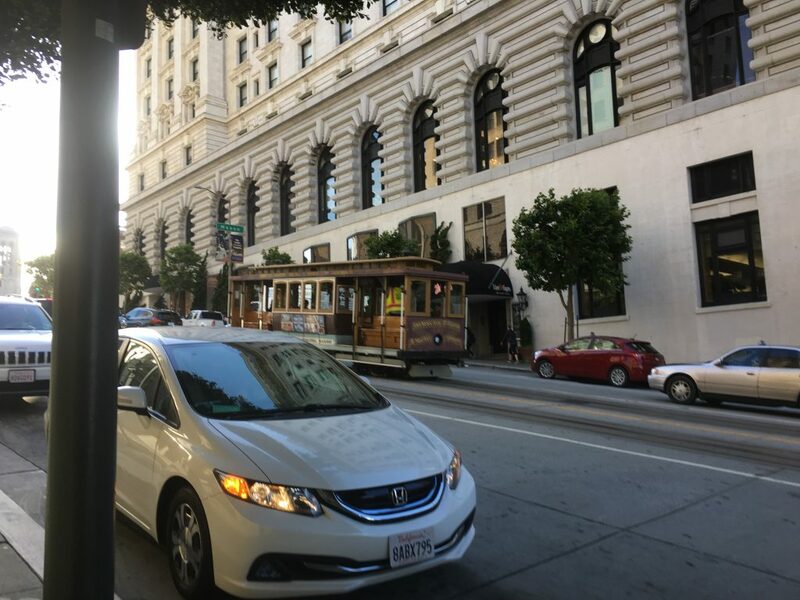 Ride a trolley/San Francisco’s cable car! 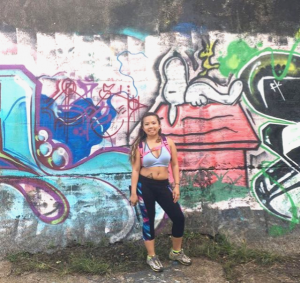 Walk the city by foot! A cemetery in the distance and in the fog. 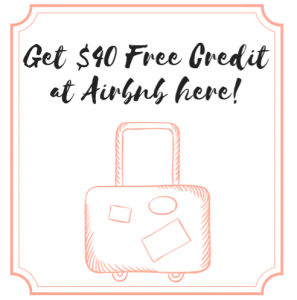 Find a Place To Stay In If You’re Visiting San Francisco! Note: This post includes affiliate links. You can read my full disclosure policy here. If you make a purchase from one of these links, I will earn a small commission but with no additional cost from you. Like most sites, my blog website needs compensation to keep it running, so thank you for supporting me to keep on helping! Gorgeous pictures – loved that one with the bridge in the distance and the pink flowers in the foreground. 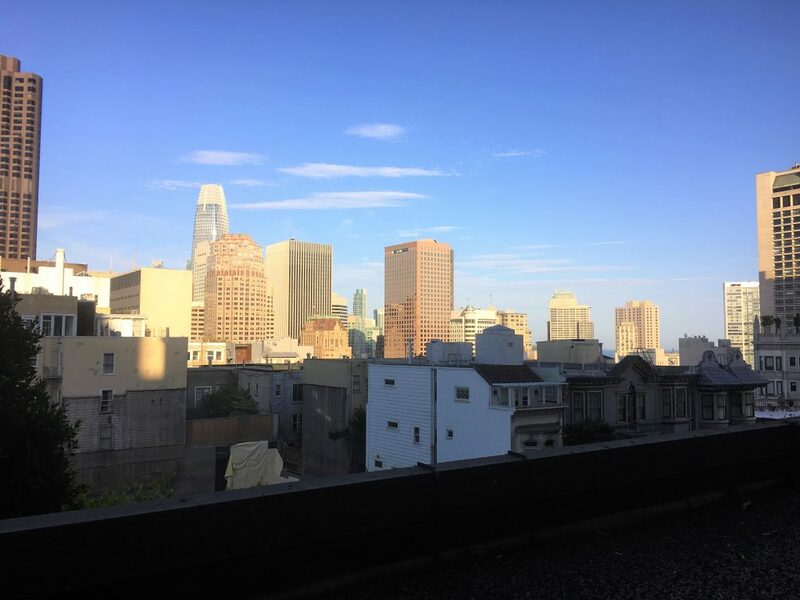 But of course they were all wonderful – I’m due for another San Fran visit! Thank you, M.B. Henry! That would be wonderful to visit again! 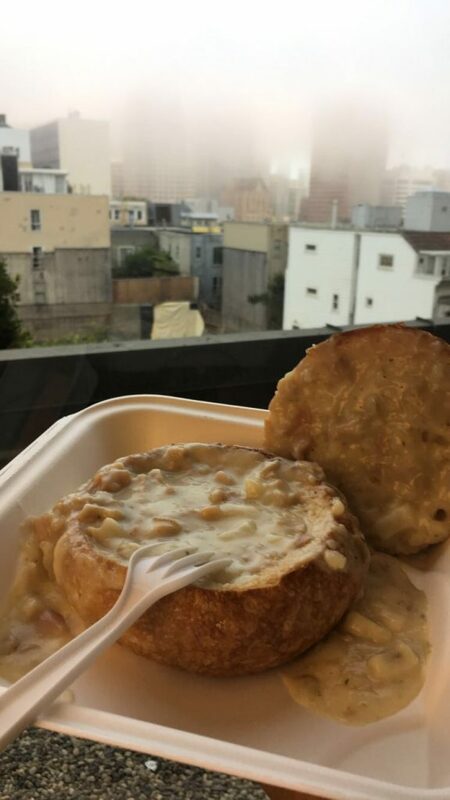 I’ve been dieting to visit San Fran! saved the blog for the future. I hope you get to see San Fran! Thank you for saving it, I also hope you’ll find this useful whenever you make a visit out there.